It's a tough time to leave school and start a business but Steve Ballmer did his best on Wednesday to make a hall full of Stanford University students feel better about their future. It was a tough sell even for Microsoft's fast-talking CEO, especially after his company announced 3,000 layoffs this week, but he gave it his best shot anyway. Funding is in short supply, he acknowledged, but there's still money out there for startups with smart ideas. 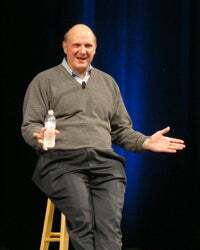 "I don't think the contraction will be strong enough that really big ideas aren't going to get funding," Ballmer said. But he had to admit that things are grim. "It really is a tough, tough, tough environment, there's no question about it," he said, addressing about 1,200 students, mostly engineers, as part of a class in entrepreneurship. Ballmer started his speech with a brief lesson in economics to explain how we arrived at this predicament. "It got this way because the world borrowed a bunch of money," Ballmer said. "The world had too much debt." He repeated his usual mantra that there is a lot more innovation to do in software. His top technology trends for the moment: multicore processors, "screens everywhere" (PC, smartphone and TV), natural user interfaces, and all content going digital. He drew an unintended laugh when he said that software companies have to keep evolving their products. "A product like software is only as good as the last release ... or two," he said quickly, remembering that Vista hasn't been a huge success. "Yes thank you," he said to laughter. "Moving right along..."
"My parents thought I had lost my mind," he said. "My dad said, 'What the heck is software?' and my mum said, 'Why the heck would anyone need their own computer?'" But the decision to leave Stanford wasn't hard because it wasn't a big risk, Ballmer said. "If things weren't working out and Bill fired me, I could always go back to Stanford," he said. He spoke for only a short time and then took students' questions. Asked about Microsoft's search business, he said being second place in a market has its advantages. "Because we're not the market leader we can experiment with new business models like cashback, we don't have to stay locked into the current user interface, and we have the luxury like a startup to try new things." He said he was glad Microsoft tried to partner with Yahoo in search and that there might still be room for a deal. "There may or may not be appropriate discussions," he said, declining to discuss it further.